Groups affiliated with Islamic extremism are showing an increased willingness to raise funds with bitcoin, according to a U.S. national security advisor. After more than a year without identifying a single instance of a group associated with terrorism publicly using bitcoin to solicit donations, the Foundation for the Defense of Democracies, which advises both public and private entities on matters relating to national security, has identified four cases in less than a month. The jump in instances of terrorist organizations fundraising with bitcoin began early last month, just as the price of bitcoin first passed the $10,000 milestone, according to new findings. But while the actual amount being raised by the outfits are still relatively tiny, the think tank’s director of illicit finance analysis, sees the spike as part of a bigger-picture exploration of cryptocurrencies by terrorist organizations. “My theory is the attention to bitcoin has probably led to certain groups taking a look at the technology,” said director Yaya Fanusie in interview. As part of Fanusie’s work to educate the public on his findings, the former Central Intelligence Agency analyst has today released a report detailing the work. Published on business security website Cipher Brief, the report details an unintended and perhaps sobering consequence of bitcoin’s skyrocketing price. Most interestingly, though, may be that rather than any cloak-and-dagger investigative techniques, Fanusie instead gathered his intelligence from online websites. Specifically, the information was pulled directly from propaganda sites for both the extremist group Al Queda and its rival, the Islamic State (IS), as well as a jihadist website monitoring group and an Israeli research institute that keeps tabs on this type of web activity. In the research, patterns also emerged. For example, after the bitcoin addresses associated with the fundraising campaigns were posted to public-facing websites, they were then promoted using Facebook and Telegram. According to the report, both of the social media sites eventually blocked the related users, but that didn’t keep new accounts from quickly popping up. While most of the bitcoin addresses failed to receive any funds, the most successful received a bitcoin donation worth about $685, used to build a camp in Syria and provide reinforcement. Shortly after the 0.0757 bitcoin was donated to the still-active campaign, the cryptocurrency (worth about $1,389) was moved to a separate account. Other fundraising activities included more mundane efforts such as website hosting. As of Dec, 19, Fanusie has confirmed to CoinDesk the funds had still not been spent. The United Nations last year estimated that the number of casualties in the Syrian civil war alone — not counting other engagements involving ISIS and Al Qaeda — is now upwards of 400,000 people. And while the total amount raised is minimal, a notable aspect of the report is what appears to be the increasing sophistication of the campaigns seeking bitcoin funds. 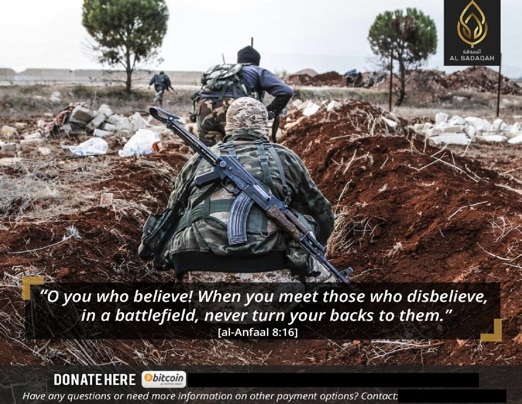 In one case, first reported by the Meir Amit Intelligence and Terrorism Information Center based in Israel, a website identified by Fanusie as being “pro-IS” appears to have initiated its fundraising campaign using bitcoin processing site CoinGate. While CoinGate told CoinDesk the user was “blocked…prior to publication of this case,” Fanusie said the website that originally posted it, Akhbar al-Muslimeen, has since generated as many as a dozen bitcoin addresses without the need of a bitcoin processor. In spite of this technical proficiency though, Fanusie hedged the overall sophistication of the operations. The pseudonymous nature of bitcoin means the technology doesn’t provide as much protection as the Islamist extremist organizations seem to believe. Still, going forward, Fanusie is concerned that could change. His report concludes with a warning that while cryptocurrency could help provide financial services to those unable to get a bank account, more advanced identity protection could even-further embolden terrorist fundraising efforts.